I don't know why I didn't go to the Momofuku milk bar when I was in New York. It crossed my mind, of course, to eat a pork bun and some crack pie but somehow we didn't make it, it didn't seem important at the time. That didn't stop me from fantasizing about this pie ever since I saw it in the Bon Appétit issue that I bought in NYC precisely. And then I saw others make it and finally, I took the plunge. Is there any going back now I wonder. The recipe is here or you can also watch Christina Tosi make it here. *The baking times were too long for my oven, I would suggest lowering the temp a bit (300F -150C) and baking it for about 30 minutes, just an idea, to avoid a dark edge and undercooked center. Ergo, you might want to make two small pies with a thin filling out of the recipe. Freeze one, or share the love, bring it to work... I only have one pie plate, and aren't I glad I brought it all the way back from Mauritius! 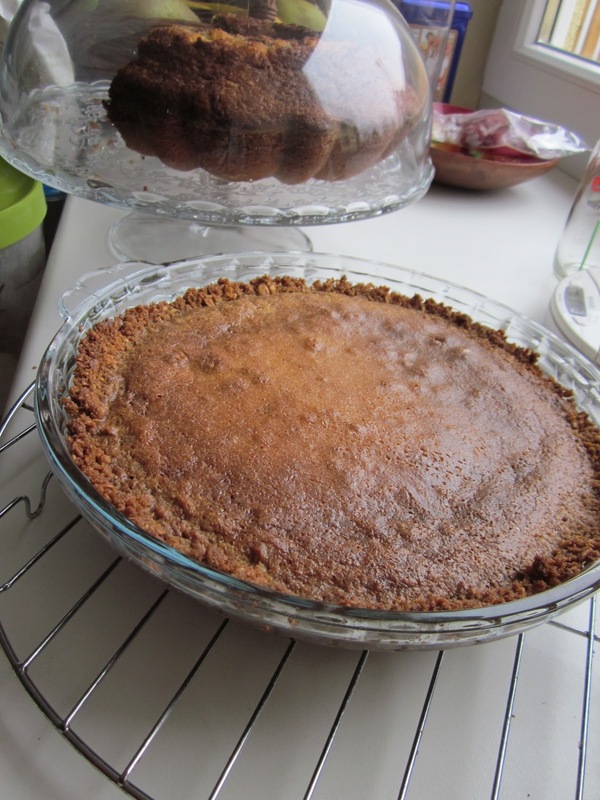 First, you bake up the crust, a giant buttery brown sugar oatmeal cookie. Then you pour a mixture of brown sugar, white sugar, egg yolks, cream, butter and for some reason, milk powder over the crumbled cookie (plus extra butter and sugar). After baking it looks good enough and smells delicious but now's the hardest part : the long wait until it's cooled down and then chilled. I couldn't wait until the next day so tried it after a few hours in the fridge and the filling oozed out in the middle. Alma (2) and I still managed to polish off over a quarter of the pie between us. Proof! The next day, it's firmed up enough and it's true, the taste has improved. The crust has melded with the filling, and as W, unfazed by the hype around the pie and its name, put it: "It's just caramel, right?". But that is not entirely true, it's rich, buttery, sugary, caramelly and very very good. 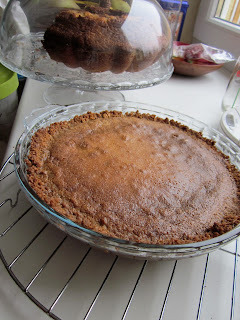 I've never heard of crack pie, am I the only one? It looks good though. More than good in fact. I've not heard of it either, but it looks good. Have added the uppcoming cookbook to my wishlist! I think the cookbook will be fun and interesting! I've not heard of it before, but it looks delicious.